Topic 33: Comparing the film Australian Rules to the book Deady Unna? 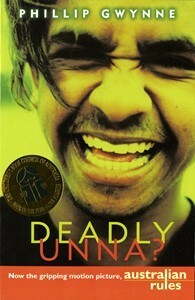 We have recently been studying the work of the author Phillip Gwynne, Deadly Unna? Once we read the book we also viewed the film that is based off of the book, Australian Rules that was directed by Paul Goldman. During the time spent on the book and film, there were many noted differences and similarities between the two different works. The characters in both the book and the film were very much the same. Both the film and book revolved around a boy named, Gary “Blacky” Black. He lives in a home with his brothers and sisters; his father is abusive and often takes his anger out on his son. Gary’s mother often tries to protect her family from their father but often comes a victim as well. Gary’s best friend, Pickles, is a boy who also plays football with Gary and has many life challenges of his own to face and overcome. Darcy is an older man who Gary looks up to as a role model; Darcy often provides Gary with advice and acts as a friend. The football coach Mr. Robertson or “Arks” is a man who is rough on the kids and strives to win; he is a bit racist when it comes to the aboriginal member on his team. Clarence is a young aboriginal girl, she is related to Dumby Red; in the book she is a possible girlfriend for Gary but in the movie she becomes Gary’s girlfriend. The characters in the book were almost the same as the characters portrayed in the film. However there were a few differences such as the habits of the characters. The character Pickles in the film exposes us to more drug use than he does in the book, Gary has a slightly different mid set compared to his character in the book. The feeling of Dumby Red’s character was different as well. In the film they left out a whole character in order to sum up the movie better and give it a happier ending. The beginning of the film starts just the same as the book. They both start off with Gary explaining a few things that is needed to understand the plot line, “…Our coach, Mr Robertson, runs one of the two local stores. I call him “Arks”, behind his back of course, because he says “arks” instead of asks…Arks son, Mark is the captain of our team…we’ve made it to the grand final and I’m the second ruck. First ruck is Carol cockatoo. He’s from the Point, an aboriginal mission just up the coast…half our team is aboriginal boys from the mission… We’re the only town on the peninsula with Nungas on our team. Without them we wouldn’t be in the grand final; without them we wouldn’t even have a team…” In the film I think I got a better feel for the plot line and I experienced what the characters were going through better compared to the book. In the film the music helped to make it seem more dramatic and help to build up the film. The set was shown better in the film as the book; you got to actually see what the landscape looked like and hot the sun was like instead to needing to imagine it. The camera shots help you to view things in a different way; we got experience an event in the film in more detail because of the camera shots in addition to how we seen it in our heads when we were reading the book. The few ending moments of the book were completely different compared to the films version of the ending. The effect these changes had on the audience was interesting. The book, gave you feel that there was many unanswered questions and gave the feeling that the family may be able to over their dads abusive ways. Were as the film tried to sum up all the characters and the ending was very ‘rounded’. These two very different versions of the story gave the audience a different view of the story line. The book was very loose and gave uncertainty were as the film was closed ending and gave the feeling as everything had worked out in the end. The scenes in the film were more lifelike than those of the book. In Australian Rules the scenes were more lifelike due to the fact that you could see the events play out and see the characters reactions, facial expressions and how they moved though the film. The book allowed you to imagine those sorts of things more, you needed to understand the situation the characters were in and try to understand what they were feeling. The film changed my feelings on certain characters, compared to the book. The book let me imagine how I think the characters looked and acted were as in the film the characters were very straight forward in their opinion, appearance and actions. The main character in the book and film were Gary Black; the side line characters that still played a main role but were not a main character were: Pickles, Clarence, Dumby Red and Gary’s Dad. I think they chose some of the right actors to play these characters, but there were many attributes portrayed in the book characters compared to the film characters. I think they could have possible casted better more believable actors to play Pickles and Dumby Red. The actor who played Gary was also seen in Wolf Creek and Neighbours along with less known movies and television series. The actor who played Dumby Red was Luke Carroll, he also acted in The Alice and Stone Bros. Lisa Flanagan played Clarence, she acted in many TV shows and films, including: Strangerland, Spike Up, The September Project, Opal Dream and Queen of Heart. Tom Budge portrayed Pickles; he also worked in the films, Son of a Gun and Candy. All the actors in Australian Rules have previously been seen on TV. I think the film would have been viewed by more people because of the actors they have chosen to play the characters. The actors age in the film were older looking as to the book; in the book Gary was supposed to be around 14 years old, in the film he looks to be around 16 or 17 years old. The target age for the book was around 14 to 18 year old however the film being more suited to 16 or 17 years old, due to classifications. I think the film tries to appeal to its audience more than the book did. The film tried to make sure the characters acted more like teens and tried to connect more with its audience. The book had free flowing characters that did act like teens but only to a certain degree. I don’t think the audience to the film would need to have any further knowledge of the book. The film explains the story well so there is no need to have prior knowledge. I think certain parts of the film were ‘dumbed down’ compared to the book. In conclusion I think that the film was better than the book. The film had a better ending than the book and showed better authority over the plot line and characters. The book had lots of information and I believe that some of the information wasn’t necessary needed to understand the story. The film was easier to understand and had a better effect on the audience. The film showed and appealed the characters better, appraised the events with more enthusiasm and tried to show the dramatics of the story. 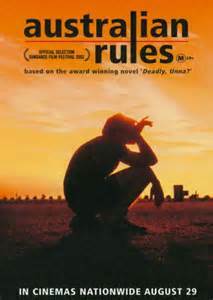 In my opinion the film, Australian Rules, was better than the book, Deadly Unna?